Vada's Blog Stamp Inks and Paper : Tag Tuesday Theme is “Valentines”. Tag Tuesday Theme is “Valentines”. Now we are talking Fun! So Won't You Be My Valentine? Louise at Kard Krazy has chosen Valentines for our theme this week. weeks now and this theme is right up my ally. 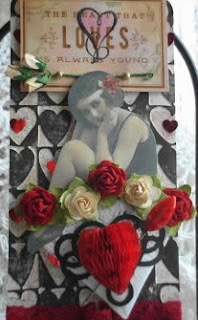 For my tag, I am using a graphic from “Magic Moonlight Graphic’s”, along with some small Prim Roses, Cuttlebug embossing folder and a Martha Steward large heart punch. I love all the details! Great Work! Ooo la la! So very fun and romantic and girlie! Your Valentine tags just keep getting better and better! Such a darling tag... I am in love! This is very nicely designed, Vada. 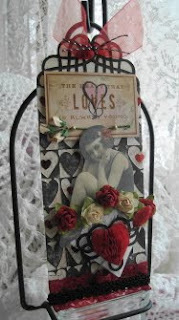 I love how you put it all together.....espcially love that large expandable heart! HI Vada, I joined in the fun but if I have time I will make some more tags - like you suffering from Tag Fever LOL. What can I say? This is just perfect...look out Hallmark!! What a Beautiful Tag.. So perfect for the theme this week!! ohhh - I think this one is my favorite! It's stunning. Love that honeycomb heart! Random Redhead Challenge “Tea Bag”. Color Change GC # 88 is Coffee & Cream. 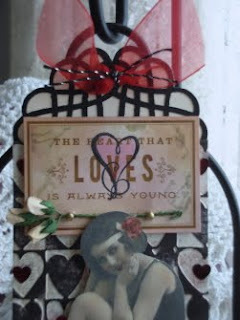 Another Tag for Bella Creations Challenge. Whisper Sweet Nothings My Valentine. For the Love of “Winter”. Tag Tuesday at Kard Krazy is Fabric. Paper Piecing and Faux Designer Paper. Did Someone Say “Party Hats”?